A public broadcaster run by strong principled leaders who thrive on encouraging diversity and democracy will be able to cultivate the appropriate dynamic tension between the broadcaster, the public and all stakeholders, writes Charlene Deacon. The ongoing debate around public broadcasting in South Africa took a new turn recently with the recall of the Public Service Broadcasting Bill by the Minister of Communications, Roy Padayachie. One of the most contentious aspects of the Bill was the manner in which it proposed to re-engineer the financial support systems for the SABC (through, amongst other things, a one percent tax levy), in an effort to address the deterioration of its financial position over the last several years. In 2005 the SABC generated a profit in the order of R380 million, but in the last year or so it had to be bailed out by government with a R1.4 billion loan structured through Nedbank. There are several factors behind this financial decline, but two in particular stand out: one is the current global recession, and another is poor financial management. Before considering these two factors in turn, it’s useful to understand where the SABC stands in relation to other public broadcasters. According to the revised edition of Toby Mendel’s Public Service Broadcasting: A Comparative Legal Survey (2011), which examines the public broadcasters of Australia, Canada, France, Japan, Poland, Thailand, the United Kingdom and South Africa, all public broadcasters strive to serve the broadest public possible, by establishing and maintaining a national identity and culture, upholding democracy and freedom of expression, and furthering a plurality and diversity of voices. To this end a public broadcaster needs to be both free of political interference and economically independent. The SABC is said to meet all these criteria of what defines a public broadcaster, except in the area of funding. Whereas most public broadcasters are heavily funded by their national governments, the SABC’s much stronger reliance on commercial funding could impact on the integrity of its programming should it choose to pander to advertisers’ instead of audiences’ needs. A second concern raised by Mendel is that although the SABC’s legislative and governance mechanisms are adequate enough to ensure independence from political interference, they are not being adhered to sufficiently well. In addition, Mendel suggests, the imposition of public interest obligations on private broadcasters, driven partly by technological changes, is making it “increasingly difficult for national governments to impose effective regulatory conditions along these lines”. At the same time the proliferation of commercial broadcasters, especially via the internet, poses a massive competitive challenge to existing public broadcasters. Despite the growth of commercial broadcasters in South Africa, the SABC is still the dominant player, with 19 stations including Channel Africa and three national television channels. The pending allocation of three more commercial licenses to private players will bring the commercial world up to par with the SABC in terms of the sheer number of radio stations, but given that the SABC continues to command half of the adspend pie, and that commercial broadcasters already have promises of performance to adhere to, imposing public broadcaster mandates on commercial broadcasters is likely to be counterproductive. Besides, South Africa has an incredibly strong community broadcast sector whose primary focus is on serving their communities. The second factor behind the SABC’s financial woes is that it appears to be unable to manage its finances appropriately. Some would argue that interference from the Department of Communications, in terms of the appointment of executive officers, has contributed in no small measure to this financial crisis due to the absence of clear leadership. But worse still, someone sold an idea which others uncritically bought, and that was that being a public broadcaster is incongruent with making profit. And so the overspending began! Given this state of affairs, what can be done to ensure the viability and sustainability of the SABC into the future? From a viewership and listenership perspective the SABC dominates the country’s broadcast landscape, and from a revenue generation aspect it dominates the adspend pie, which suggests that any ‘turnaround strategy’ should focus on how the SABC can be run in such a way as to make best use of its inherent strengths and funding opportunities. A strong SABC is fundamental to the success of South Africa’s broadcast industry as a whole. First and foremost, such a strategy cannot ignore the country’s history. Among the many disparities created by apartheid was the manner in which the majority of the population was restricted in its access to the media, which at the same time meant that the various types of information provided by the media reached only a limited proportion of the population. When SABC 1 became the main public broadcast channel it opened up enormously important streams of both information and revenue, and a key component of both of these was advertising. This development immeasurably enhanced an earlier but still important form of dissemination of information, notably radio programmes and advertising, which were indispensable for many people for many years. If, then, the SABC were to stop advertising (which is the case with many other public broadcasters across the globe), where would those who currently advertise through its channels find the markets that they are currently reaching and, in turn, would the listeners and viewers in these markets be deprived of valuable information? Together with these potentially negative consequences, what would be the effect on minority markets? In other parts of the world, the fact that public broadcasters are required to cater to minority markets is sometimes seen as a burden; in South Africa this is not seen as an inconvenience, since minority markets here still carry great economic clout (as much as 50% of GDP), but it would be foolish for a public broadcaster not to take maximum advantage of existing opportunities. Furthermore, public funding models have similar drawbacks to commercial funding ones, for programming integrity can be swayed just as much by political as by economic interests (as our history also tells us). Before adopting a new funding model for the SABC it will be necessary to ensure that any additional reliance on public funding does not surreptitiously open up a back door for greater political interference. One way to ensure this is to conduct, from a principled vantage point, a thorough assessment of the SABC’s internal structures, culture, values, policies and procedures, as a prelude to developing a healthy and independent corporate culture. It would also be wise to make certain that any public grants have specific conditions attached, for example for the development of languages and other issues deemed to be in the national interest. These grants could be overseen by an independent public advisory council mandated by the Board of the SABC to give the interests of all sectors of society a fair hearing when the monies are allocated to independent producers. A public broadcaster run by strong principled leaders who thrive on encouraging diversity and democracy will be able to cultivate the appropriate dynamic tension between the broadcaster, the public and all stakeholders. A public broadcaster that can turn a profit will be far better off with regard to its own future sustainability; even more importantly, it will be able to invest in the creation of local films, dramas and television programmes. 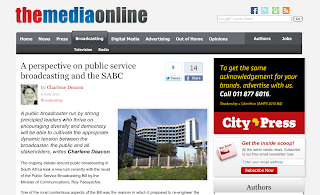 The SABC can be made both principled and profitable. Copyright © 2011 The Media Online. All rights reserved.